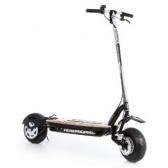 The Super Turbo 1000-Lithium Electric Scooter is by far the fastest and best quality scooter in the market. 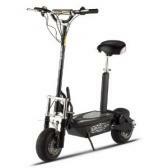 Developed as an improvement of the 800watt model, this scooter uses a powerful 1000watt 48-volt 3000 revolutions per minute motor that produces a maximum speed of 32 miles per hour. 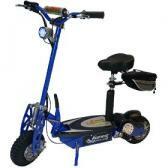 It comes equipped with a speed varying option so that you either have maximum speed or maximum distance. 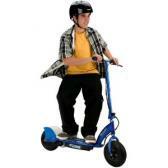 We found Amazon.com to have the best prices on the Super Turbo electric scooter. Click here to check it out. The battery used in the Super Turbo 1000 is a 48-volt LifePo4 that when fully charged can cover a distance of up to 23 miles. This battery is so powerful and revolutionary that it retails for $500. The lifespan of this battery is four times longer than the regular SLA battery and weighs a quarter of the weight at 12lb. It charges one and a half times faster and can take up to 1000-1500 charge cycles compared to the SLA’s 250-350 cycles. You can never go wrong with the Super Turbo 1000-Lithium electric scooter. It can hold a maximum weight of up to 350lbs. It is available in several colors including blue, silver and black. 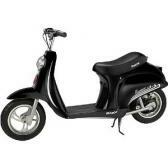 This scooter model includes a large cargo rack, a storage bag, an LED headlight, Lithium charger, a free tool kit and a removable comfort seat so you can ride while standing. Quality assurance is the name of the game with this Super Turbo electric scooter. It comes with a 6 months warranty on bumper to bumper plus a full one year warranty on the motor. In addition to this you get free on phone tech support for as long as you wish. You do not have to be stuck in any way as you enjoy the ride on your electric scooter. There are 17 reviews on amazon.com on the Super Turbo 1000-lithium electric scooter and about 90 percent of these rate it at 5-star, the highest rating. The speed this scooter can attain seems to be the most impressive feature. On turbo mode you get to go faster but the battery drains faster too. You can also choose to go on econo mode and go further on the same amount of charge but at a slower pace. Some features like the removable seat gives you the flexibility of riding while seated or standing for more drama. Click here to read these reviews. 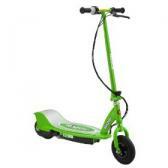 The only time you cannot use this scooter is in the rain since it is not waterproof. Otherwise it is ideal for a quick run to the corner shop and some reviewers actually use it as the choice mode of transport to and from work. There are some reviewers who would like this model to be available in brighter colors such as orange so as to distinguish it from the predecessor, Super 800. Overall the Super Turbo 1000-Lithium Electric Scooter is by far the fastest and slickest scooter in the market. All you have to do is charge it up for three and a half hours if the battery is completely dead and it will give you up to one hour of moderate speed riding. The price for this beauty is actually a bargain in view of all the features it offers. Click here to check it out. How would you rate the "Super Turbo 1000-Lithium Electric Scooter"?